Some multimedia features of Eternal Egypt require the Macromedia Flash player. Consult the Plugin Help page to learn about the technical requirements of Eternal Egypt. A naked statuette of Harpocrates, standing on an oblong base with his left leg forward. 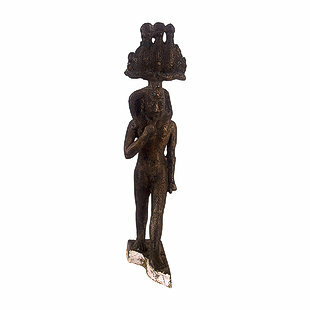 He wears the Atef crown, a triple crown; at the top it bears three sun disks with a cobra at each side. A hanging lock of hair indicates his youth and there is a cobra on his forehead. As in all of his statues, he is holding his right index finger in his mouth.